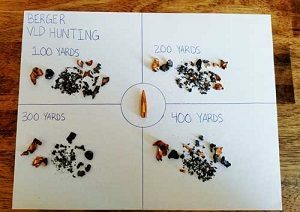 26 Nosler 140 Grain Berger VLD-Hunting~ The 26 Nosler is designed as a modern 6.5mm cartridge, using recent advances in firearm technology to attain exceptionally high muzzle velocities (up to 3,400 ft/s (1,040 m/s)) and maintain an extremely flat trajectory. The overall cartridge length of 3.340 inches (84.8 mm) is the same as that of the .30-06 Springfield, allowing the use of widely available standard-length actions. All four of Nosler’s Cartridges the .26 Nosler, .28 Nosler, .30 Nosler, and .33 Nosler are based on the same .404 Jeffery parent case. While the 26 and 28 Nosler share the same cartridge case dimensions, the 30 Nosler has a slightly shorter length to the shoulder dimension than the 26 and 28, and the 33 Nosler has a shorter shoulder dimension yet than that of the 30 Nosler. Nosler claimed that the .26 Nosler was the most powerful commercial 6.5mm cartridge in the world, however since the release of the 6.5-300 Weatherby Magnum in 2016 it is the 2nd most powerful 6.5mm cartridge. 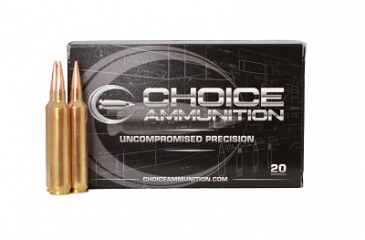 Choice Ammunition is proud to release the Nosler cartridges in 2018! Our 100% Hand-Loaded, premium ammunition is perfect to compliment these calibers. You will find our proprietary formulas to be loaded with extremely tight loading tolerances, providing the most reliable, accurate and dependable round of ammunition available. 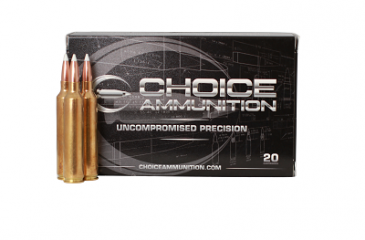 All of the Nosler calibers will include a selection of bullets only available at Choice Ammunition! 26 Nosler 140 Grain Nosler AccuBond-Hunting~ The 26 Nosler is designed as a modern 6.5mm cartridge, using recent advances in firearm technology to attain exceptionally high muzzle velocities (up to 3,400 ft/s (1,040 m/s)) and maintain an extremely flat trajectory. The overall cartridge length of 3.340 inches (84.8 mm) is the same as that of the .30-06 Springfield, allowing the use of widely available standard-length actions. Through an exclusive bonding process that eliminates voids in the bullet core, Nosler AccuBond couples Nosler’s proven copper-alloy jacket with its special lead-alloy core. The result is a bullet that flies true, penetrates deep and retains its weight, without causing extensive barrel fouling. The unique white polymer tip resists deforming and initiates expansion on impact. Nosler’s Solid Base at the rear of the bullet acts as a platform for large diameter mushrooms.